There will be a lot of sharing and discussions about the original diet plan. Everyone is free to share their experience and weight loss results in our closed group. 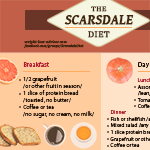 You will be able to post your before/after photos, as well as share advices on preparing the Scarsdale diet meals.